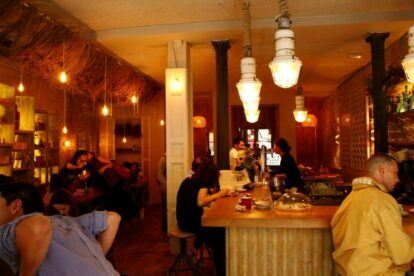 The abundance of bars and restaurants in Madrid are just staggering and it seems like there’s a new place opening up every week, at least in the part of Malasaña. Maricastaña is one of these new places. It’s perfectly suited for people of all ages looking for a fresh and modern place to eat. The kitchen has a very refreshing view of classic dishes like fried green tomatoes and a local favorite, the croqueta. Croquetas are usually deep fried bechamel balls in many different varieties. Maricastaña makes them with pumpkin and ham and I have not been here a single time without eating them. It would almost be a crime if I didn’t mention the desserts they serve here, like the cheesecake. They are utterly delicious and completely homemade. The restaurant is divided into 2 separate floors so there’s always a place to sit and if you arrive without a reservation you should not have to wait very long to get a table.